The countdown is on to the Celebrate Hailsham Day event, set to bring energy and a summer feel to the town centre. 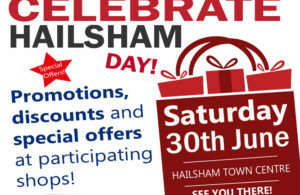 Celebrate Hailsham Day will be making a comeback on Saturday 30th June from 9am to 3.30pm and organisers are pleased to be working with the town centre shops once again, many of which will be offering discounts off their goods and special promotions on the day. Celebrate Hailsham Day will also feature the usual Street Market stalls in Vicarage Field, selling a range of locally sourced food, gifts and accessories. The Sussex Stompers (formerly The Jazz Caverners) and The Memphis Flyers will be providing music entertainment, plus Hailsham FM will be broadcasting live at the event and there will be free face painting available for children, courtesy of Christchurch. The event will also feature a sensory tent in Vicarage Field, activity stalls from a range of local community groups and Hailsham Lions will be selling candy floss to everyone on the day. “There will be a range of stalls from local and regional traders selling high quality products, as well as some fun activities for children and refreshments available throughout the day,” said Deputy Town Clerk & Business Enterprise Manager Mickey Caira. Hailsham Town Council is also organising a Summer Market (with the support of Hailsham Forward), which will take place on Saturday 28th July, at which Vicarage Field will be home to the usual Saturday street market stalls selling a range of locally sourced food, as well as gifts and accessories. There will be live music throughout the day from El Banda Burros (1pm-2.30pm) and the Peter Willson Jazz Quartet (10am-10.45 am and 11.15am-12pm). Harvey’s of Lewes will be providing a beer tent and selling wines, plus their will be hot pasties on sale, Hailsham FM will be broadcasting live at the event and there will be free face painting available for children, courtesy of Christchurch. For further information on events organised by Hailsham Town Council, please contact Karen Giddings on 01323 841702 or by email: karen.giddings@hailsham-tc.gov.uk.